Neighboring the tallest Mountain in the world, Mt. Everest to the north, Imja Tse or majorly familiar as Island Peak is the most famous peak climbing among adventure admirer. Island Peak Climbing can be summited even if you have little technical knowledge or none but demands good physical condition as the trail is steep. It can too be considered as the beginner training before climbing the high mountains as did by a British expedition before summiting Sagarmatha. Standing on the top of miraculous Island peak at an altitude of 6189 meters offers a breathtaking scenario of the giant Himalayas of eastern Nepal. Island Peak falls under Sagarmatha National Park to the east-northern side of Kathmandu. The peak name was given by Eric Shipton's party in 1951 as they saw it as an island in a sea of ice from Dingboche. It was first submitted by a British expedition in 1953 as a part of training before heading to summit Mt. Everest. Island Peak Climbing with EBC journey begins with 35 minutes of adventurous flight from Kathmandu to Lukla. Lukla Airport is also known as Tenjin Hillary Airport is one the world's top ten dangerous airports built with the narrow runway. From this point, we set on foot for the rest of the duration. Before climbing the incredible Island Peak, we head towards the world's popular trekking destination at the base of Mount Everest. Take a glimpse of earth's miracle the snow-capped Himalayas then, divert to the path of Island Peak from Lobuche. Summit the challenging Island Peak, observe the stunning views and back to Kathmandu. Day 05: Trek to Pheriche. Day 06: Trek to Lobuche. Day 07: Trek to Everest Base Camp and stay at Gorakhshep. Day 08: Hike to Kala Patthar, trek down to Lobuche. Day 09: Cross Kongma La & trek to Chhukung. 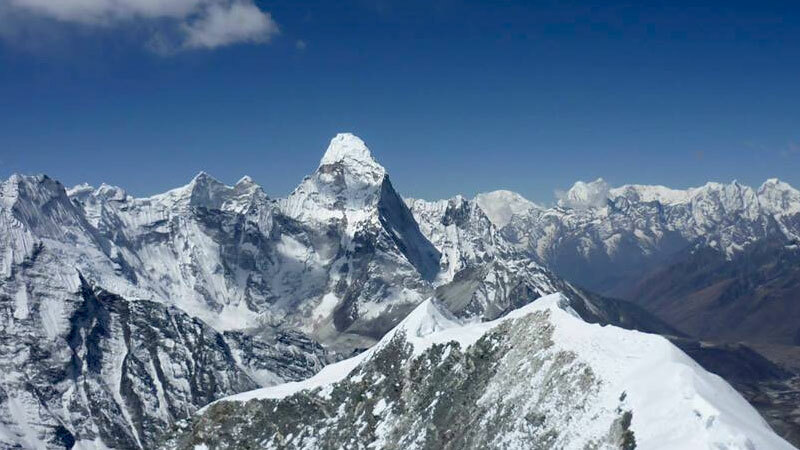 Trail Attractions: Cross Kongma La Pass, follow Khumbu Glacier moraine, view of Mt. Khumbutse, Lingtren, Pumori, Nuptse and Mahalangur Himal. Max Altitude: 5,535 m / 18,159 ft (Kongma La pass). Day 10: Trek to the Base of Island Peak. Max Altitude: 5,200 m / 17,060 ft. (Island Base Camp). Day 11: Climbing Training Day. Day 12: Island Peak Summit Day. Max Altitude: 6,189 m / 20,305 ft. (Island Peak). Overnight: Tent at Island Peak Base Camp. Day 13: Trek to Pangboche. Day 14: Trek to Namche. Arrival at Kathmandu and transfer to your hotel. Island Peak Climbing with Everest Base Camp trip finished here! Teahouse/Lodge Accommodation while on Trek to Everest Base Camp. Tent accommodation while on climbing to Island Peak. Wants some modification on Island Peak Climbing with EBC itinerary? contact us to customize it.